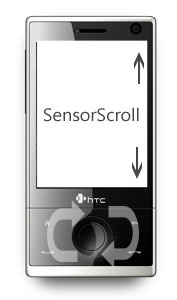 SensorScroll is a Windows Mobile application for HTC Touch Diamond and HTC Touch Pro. It uses the touch sensor control for various actions like scrolling, emulating key press and so on, while the user uses the control. In order avoid duplicating the information please check the main download and description page. - Temporary removed windows enumeration in SensorScroll Settings. I'll try to put some more complex code to handle poorly working API functions in the next version. - Fully changed working principles. Should be much more stable and compatible now. - Added support for screen rotation. Read the manual about the 3 key screen rotation. - Added support for process identify. Read the manual. - Added handling of power notifications. Now it should consume almost no CPU when suspended. - Added support for vibrate feedback for "touch gestures switch", "screen rotation", "process identify"
- Removed process enumeration in SensorScroll Settings. This caused more problems then it solved. - Improved the way SensorScroll imitate scroll/keys. Now it should work in more windows. - Fixed a small bug in SensorScroll Settings resulting in not displaying the default item when the settings file is corrupted. - Added support for on the fly reloading of both SensorScroll Settings file (named settings.dss) and no_process.txt. - Big number of small changes, which should result in more stable behavior. - Included camera.exe in no_process.txt. - Included several applications which run at Windows Mobile start-up, in no_process.txt. Now it should never hand at start-up.